Todd W. Frieze, MD, FACP, FACE, ECNU, CCD, has been practicing endocrinology for more than 17 years. He received his medical degree from Emory University School of Medicine in Atlanta, Ga. Dr. Frieze completed an internship and his residency in internal medicine at Wright-Patterson Medical Center at Wright-Patterson Air Force Base in Ohio. He also completed a fellowship in endocrinology at San Antonio Uniformed Services Health Education Consortium in San Antonio, Texas. Dr. Frieze is board certified in endocrinology, diabetes and metabolism by the American Board of Internal Medicine and has special training in thyroid imaging and bone density imaging. He is a member of the American Association of Clinical Endocrinologists, Endocrine Society, American Society for Bone and Mineral Research, American Thyroid Association, National Osteoporosis Foundation, American College of Physicians and American Medical Association. 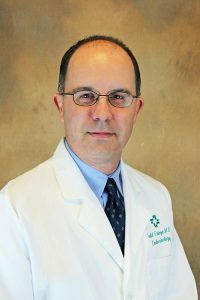 At Hattiesburg Clinic Endocrine Care, Dr. Frieze provides treatment for a variety of endocrine disorders, including thyroid, osteoporosis and metabolic bone, calcium, adrenal and pituitary. He also treats certain male and female reproductive disorders. Hattiesburg Clinic Endocrine Care is a specialty department that deals with hormones and the glands that produce them. Our areas of focus are the thyroid, pituitary, parathyroid, adrenals, ovaries and testes. Emory University School of Medicine – Atlanta, Ga.